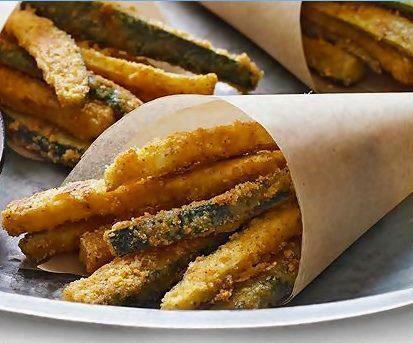 Trim the zucchini -cut crosswise in half, then cut each piece into 1/4-inch sticks. Add cheese to coating mix in shaker bag; shake gently to combine. Whisk egg in medium bowl. Add zucchini; toss to coat. Use tongs to place 1/4 of the zucchini in shaker bag; close bag and shake to evenly coat. Spread onto baking sheet sprayed with cooking spray. Repeat with remaining zucchini. Bake for 12 to 13 min. or until golden brown, turning the baking tray 180 degrees after 7 min to facilitate even baking.